Lift for Life is an effort by the Penn State football team to raise money for the Kidney Cancer Foundation. Sponsored by the Penn State Chapter of Uplifting Athletes, Lift for Life has so far raised over $500,000 to combat this disease. 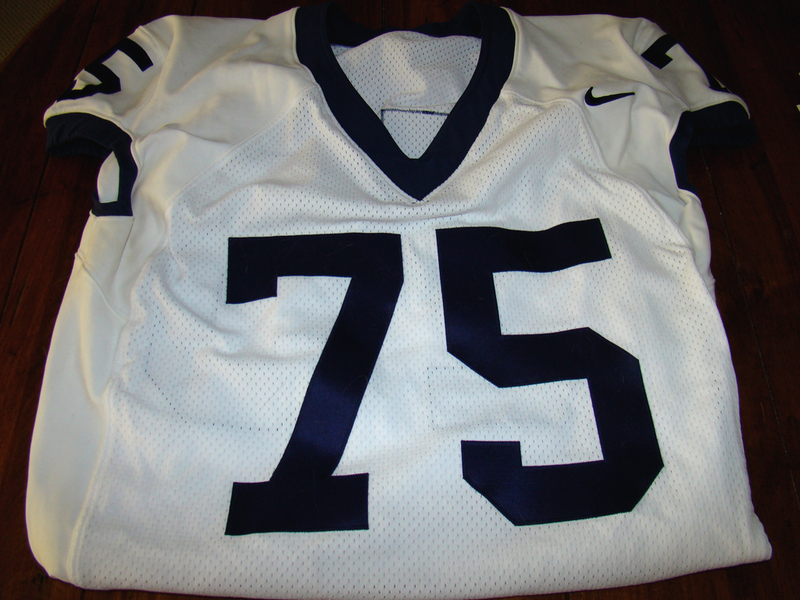 I have already written once about #75 Eric Shrive, whose jersey is pictured here, in relation to Penn State’s Lift for Life. He is Vice President of Uplifting Athletes. His picture with a link to Uplifting Athletes is on my blog, with an appeal for donations. He was one of my students this spring, and during finals week he asked me to help publicize Lift for Life through my blogs and the Bleacher Report. His goal at the time was to raise $15,000 for the Kidney Cancer Foundation. Right now as far as football players are concerned, #75 is my hero. Eric is leading the football team in this kidney cancer fundraising effort and setting an inspiring example for leadership off the field. Which, I venture to say, will likely translate to Eric being an offensive line leader on the field. It's clear to me that when Eric is committed to a mission, he makes sure it happens. Since my first article appeared, Eric and I have had a few email exchanges. Most of Eric's fundraising comes from family, friends, and businesses in and around the Scranton, Pennsylvania area where he is from. But Eric keeps telling me that there are donations from people he doesn’t know. He suspects that they are coming from my readers, for which I thank all of you who have responded. When Eric was close to his $15,000 goal I emailed him and congratulated him. His response hit me like a ton of bricks. He told me that in the last few weeks his effort has become very personal. His uncle was diagnosed with kidney cancer, and had his kidney removed last week. His uncle is now in recovery from that operation. Eric’s original desire to exercise leadership skills has now become a mission to help save a family member’s life. As a result, he has redoubled his efforts to raise money. His goal now is $22,000, and he’s getting close to achieving that. He has raised nearly half of the $48,000 raised by the football team so far. So how can you help? If you’re in State College area next weekend, try to attend. If you can’t be here in person, think about donating to this cause. Who’s your favorite Penn State quarterback? Rob Bolden? Matt McGloin? Paul Jones? Kevin Newsome? Cast a vote and send a message with your donation. Why not? Pick your favorite running back, Stephfon Green, Silas Redd, or Brandon Beachum. Pretend you’re making a bet on who’s going to start and make a donation. Have some fun with it. Or how about supporting Mike Farrell, the President of Penn State’s Uplifting Athletes? He’s also working very hard to make sure Lift for Life is a successful event, and perhaps could use a boost. If you can’t decide, that’s okay too. You can just donate to the entire Penn State team, or to your favorite freshman recruit on whom you’re betting Penn State’s future. Or, of course, you can help Eric Shrive surpass his goals for the third or fourth time, letting him know that the Nittany Nation stands behind him and his family and admires his accomplishments in this year’s efforts. As for the #75 jersey, that’s the number I plan to wear on “favorite jersey day”. Don’t forget, next Friday July 8 at Holuba Hall is the actual Lift for Life event, from 2-7 p.m.. Come out and enjoy! And bring memorabilia for autographs. You know now whose autograph I will especially seek.